President Donald Trump speaks while meeting with Egyptian President Abdel Fattah el-Sisi in the Oval Office of the White House, April 9, 2019, in Washington. Facing bipartisan pushback to his immigration shake-up, President Donald Trump said Tuesday he's not looking to revive the much-criticized practice of separating migrant children from their families at the southern border. 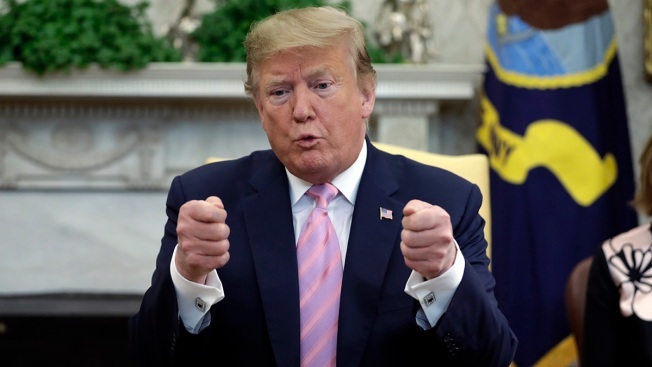 At the same time, he suggested the policy had worked to deter migrants from coming into the U.S., although he offered no evidence to support his position. Attorney General William Barr, speaking to members of Congress about his department's budget request, echoed the president's statement. "I support the president's policy, which is we're not going to separate families," Barr said. The potential reinstatement of one of the most divisive practices of Trump's tenure was just one aspect of the upheaval at the Department of Homeland Security this week that culminated with the resignation of Secretary Kirstjen Nielsen. Acting Deputy Secretary Claire Grady, a 28-year civil servant, technically next in line for secretary, was forced to resign Tuesday to make room for Trump's pick to replace Nielsen, according to two people familiar with the decision. With talk that more top officials were likely to be ousted, Republicans expressed public and private concerns about the shake-up orchestrated by the White House and cautioned that leadership changes wouldn't necessarily solve the problem. As for the separation of children, Trump declared that he was "the one that stopped it" and said his predecessor, President Barack Obama, was the one who had divided family members. Administrations are allowed to separate children under certain circumstances including for the health and welfare of the child and due to a parent's criminal history. This is why children were separated under the Obama administration. At hearings across Capitol Hill, lawmakers grilled administration officials on whether the practice would resurface despite last year's outrage and evidence that separations were likely to cause lasting psychological effects on the children. House Oversight Committee Chairman Elijah Cummings, D-Md., also said his committee would take a look at the staff shake-up at Homeland Security, although he said he had not decided on calling in Nielsen. "If everybody's sitting around waiting for a shiny new wonder pony to ride in and solve it, we're going to be waiting a long time," he said. 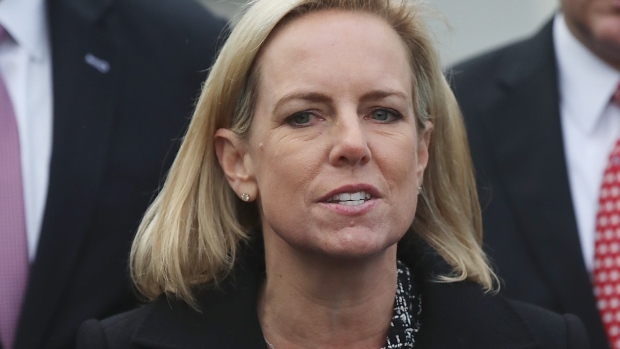 Former Homeland Security Secretary Kirstjen Nielsen addressed the media on Monday after resigning from her position in the Trump administration this weekend. People familiar with the immigration discussions within the administration said family separation was one of several ideas Trump had revived in recent weeks as he and his aides try to tackle the problem of an ever-growing number of Central American families crossing into the U.S. The people were not authorized to speak publicly and spoke to The Associated Press on condition of anonymity. A senior administration official who briefed reporters on condition of anonymity Tuesday said the president had made a series of leadership changes at DHS due to frustrations that department officials weren't fast enough at implementing changes, such as a new regulation that would challenge a longstanding agreement limiting how long children can be detained, that could spark a legal fight that would land in the Supreme Court. The White House also was weighing a tougher standard to evaluate initial asylum claims, proposing a "binary choice" that would force migrant families to choose between remaining with their children in detention until their immigration cases were decided or sending their children to government shelters while the parents remained in detention. Amid the pushback, Trump told reporters he was not "cleaning house" at the agency despite a number of staff changes. He said his choice to be the department's new acting director, Kevin McAleenan, would do a "fantastic job." But as Trump was speaking, the senior administration official was making a case to reporters about why the president felt changes were necessary. He described the agency as a large and unwieldly civilian bureaucracy in need of leadership that can deal with career officials resistant to the president's agenda, including many responsible for implementing some of the very policies Trump seeks to roll back. Top Republicans in Congress also expressed concern over vacancies at Homeland Security and cautioned Trump to heed off more churn after Nielsen's resignation. Sen. Chuck Grassley, R-Iowa, made both a public and private plea to the White House not to dismiss career homeland security officials, including the director of United States Citizenship and Immigration Services, Lee Francis Cissna, whose future remained uncertain Tuesday. He said he had spoken to acting chief of staff Mick Mulvaney but "never heard anything final" about Cissna. "I hope members of the administration are actually listening," said Sen. Ron Johnson, R- Wis., the committee chairman. He added that he had spoken with Mulvaney about moving a permanent Homeland Security nominee through quickly. Some of Trump's outside allies are urging him to nominate former Kansas Secretary of State Kris Kobach to lead the department, while others are pushing former Virginia Attorney General Ken Cuccinelli for the job. Both men's names also have been tossed about for a possible immigration czar who would coordinate immigration policy across federal agencies. Associated Press writers Kevin Freking, Lisa Mascaro, Laurie Kellman, Alan Fram and Darlene Superville in Washington and Nomaan Merchant in Houston contributed to this report.